“100% Organic” means the product contains all organic ingredients, with the exception of salt and water as these are not certifiable. These products cannot be affected by the “big three”: irradiated, contains genetically engineered organisms (GEO’s), or grown with sewage sludge fertilizer. If the label only says, “Organic,” 95% of the ingredients in the product are organically grown. A label that says, “Made with Organic….,” means that 70% of the ingredients within the product are organic. The “big three” rules apply here, for the 70% organic ingredients as well as the 30% non-organic. 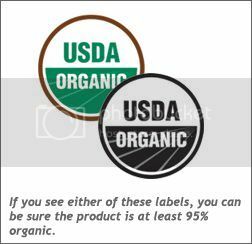 The supplier may list up to 3 ingredients that are organic on the front of the label. Labels that list organic ingredients on the side panel of the package contain less than 70% organic ingredients. There can be no organic claims on the front of the label. The “big three” are allowed to be in the non-organic ingredients.